Those loyal and stalwart few who follow the Dice Hate Me Twitter feed regularly know all about #lunchgames – my semi-daily tweet around lunch time that summarizes my office’s epic battles over burgers and baked goods in 140 characters or less. Sometimes I can claim victory, but more often than not I end up spiraling to my oblivion, leaving one of my coworkers – or, typically, the luckiest player on the planet, Clover Leaf – to stand victorious. Michael Fox is one such reader of #lunchgames. 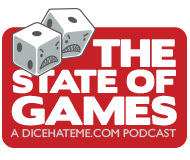 Michael (@idlemichael on Twitter) also happens to write reviews and produce an extremely swell podcast for The Little Metal Dog Show website, all about – you guessed it – games. Michael and I sat down recently – in a virtual sense, of course – and talked a bit about #lunchgames, how my office mates and I make it happen on a daily basis, what games are best for just such a thing at anyone’s place of work, and just how lucky one Clover Leaf can be. DICE HATE ME: Hah! Yeah, I’m usually bemoaning my loss to Clover Leaf. Curse her luck powers! I started using the #lunchgames hash tag on a whim a few months ago because I needed to share a particularly heated game of Bang! in the office, and I figured readers of Dice Hate Me wouldn’t care to read about it in an entire blog post. The tradition of playing games at lunch started way before #lunchgames, though. My buddy Dan and I are lucky enough to work in the same office together and we both enjoy gaming, so we started bringing small, head-to-head games in to play for a few minutes at lunch. We started out with quick, pub-style games like Cathedral, Pylos, Head-to-Head Poker and Pentago. As our office grew, it became apparent that a few of our coworkers were itching to get into the action, so we graduated to the multi-player dice game YamSlam. One day, I thought it would be fun to bring in something meatier and get as many people into the action as possible, so I brought in a surprise – Red November. It took awhile for everyone to wrap their minds around the concepts, and it took two days of lunches to finish the game, but by the end, everyone was hooked. The rest, as they say, is history. LMD: So how long’s a lunch break for you guys? And how do you decide on what you’re going to play? DHM: Typically, we take about a thirty minute break to play games. Depending on the game, we may end a little early or run over just a bit. On an off week, we may spread a more lengthy game over two or three lunch periods just to get some variety. As far as game choice, we’re pretty wide open since everyone who gets involved likes to try and play all sorts of games. Typically, our base criteria is length – we tend toward games that are quick-moving, can be completed in thirty minutes or so, and aren’t spoiled if someone has to walk away from the table for a couple of minutes. In the past few months, we’ve also started favoring games that get everyone more directly involved with one another, whether that’s through negotiation, alliances, backstabbing, or just straight-up skullduggery. The two most typical games in this category would be Bang! and Lifeboat. I’m not sure exactly what this says about all of us, but it is a testament to how much we actually like working with each other that we’re able to walk away from the game table without animosity. LMD: I was going to ask about that… Do you get much in the way of bad losers? I know that some of the people I work with would take a bad result pretty negatively! I reckon it could overflow into our work life…What’s the worst case of attitude you’ve had to deal with? DHM: Occasionally someone will get a bit down when they’re ganged up on in Bang! or Lifeboat, but for the most part it all evens out since we play so much. We all know that revenge is only another day away! We tend to joke about some of our long-term grudges. One is forming now between me and Clover Leaf in Citadels – she keeps assassinating me or stealing my gold or cards, sometimes even by accident. It becomes a game within a game, sometimes. In a strange way, all the lying and cajoling actually creates a stronger bond between us at work, and as friends. LMD: Ahhhh, the famous Clover Leaf! You guys seem to have something of a running war, generally with you on the losing side. Who else do you have in your group? Is it a regular bunch who meet up every day or do you have folks switch out dependent on what’s being played? DHM: Hah, yes, Clover Leaf and I have a little running war, but it’s all in good fun. I will admit that it’s a bit of a lopsided battle, as her mysterious powers seem to influence most games. My biggest nemesis is still my wife – she’s the model for the gamer I call The Sphinx. Not only does she have some luck powers, but she can also calculate the outcome of a game after the second turn, sometimes. I can get the upper hand in some games, but if the game has a victory point track, forget it! As for our lunch gaming group, we usually game with about five people, including myself. The usual suspects include Clover Leaf, Sally Thinksalot, my buddy Dan, and Zach, who is a bit of a Sphinx. Sometimes on Fridays we’ll convince one of our bosses, Scott, to join in on a big game of Bang!, which is usually fun because he has an uncanny knack of blowing himself up with Dynamite. Our lunch gaming group has become so fond of the games in my library that we’ll sometimes plan an after-work game night just to get some play time with longer, more indepth games. That’s when we’ll break out Small World, Last Night on Earth and games like that. Alien Frontiers is probably next on the list – everyone’s been wanting to give that a shot since I’m raving about it constantly. LMD: Nice! You’ve mentioned a few games already that fit well into your constraints – any other recommendations? Stuff that you’ve got planned but haven’t managed to get to the lunch room yet? DHM: Oh, I have plenty of recommendations. Some of the games we’ve played that fit well within the format for lunch games include Spy Alley, Aquarius, Chrononauts, Forbidden Island, Dixit, Quoridor, Trivial Pursuit Steal, and some board game classics such as Clue and Fireball Island. Citadels is a new addition for us, and so far everyone has enjoyed it. It runs a bit long, but as players get familiar with the character roles the game will speed up. Also, we are lowering the game ending conditions from eight districts to seven in order to fit a full game in. We have no qualms about changing up a game to suit our time constraints or play style; just about every game we play has a list of house rules! As for what’s in store for future #lunchgames – I have a whole closet full of games I’d love to introduce to the group, including some old Steve Jackson classics like Munchkin and Illuminati. A lot of Fantasy Flight Silver Line games would work well, as would fast-paced board games like Castle Panic. After New Year’s, I’d love to see if anyone would be up for an extended campaign, of sorts. Now that all the players are veterans of some of the more complex game systems, I’d love to take really long, involved games such as Axis & Allies and play it over several lunch sessions. Then we can extend our grudges over several weeks, instead of just a couple of days! LMD: Loads of great suggestions there. I reckon you could probably play something like Dixit with anyone – not necessarily just gamers, but it’s such an appealing looking game you’ll invariably get people walking up just trying to work out what’s going on. How did you start your lunch group? Did you just break out a board and sit there, desperately hoping someone would sit down and start playing? DHM: Oh yeah, Dixit is competely approachable by everyone. Our company has a retreat every year, and I took a ton of games with me, as usual. One of the games was Dixit, and all the kids there, from ages 6 on up, totally loved it. We played an adults-only game a few times, and the clues had some definite adult humor mixed in, but it was really easy to tone down when the kids were involved. The lunch group started small, at first – again, it was just me and Dan playing some two-player games, at first. We’re lucky in that we have a very small office, with a group that is pretty close. It wasn’t long before others in the office were watching the games and asking if they could join in. We were more than glad to open things up to other players. In a larger office, I would think it would work in much the same way – all you have to do is start with one other player and then the real gamers will come out of the woodwork. It’s like that when you play in public – my wife and I started playing games at our local bar and now some patrons and our favorite bartender join in whenever they can. All it takes is one cool-looking game and you can hook so many people! LMD: It’s all about pitching it correctly, I reckon… The right game should work in pretty much any situation, but have you had any major disasters? Like, attempting a game that completely fell flat with the group? DHM: Oh yeah, there have been games that our group disliked almost immediately. Fluxx is definitely a game that isn’t quite suited for our group, or for lunch. I’m not a big fan of Fluxx to begin with, but with the right group it can be fun. Our lunch group – although hilarious and silly – just hated the totally random elements of Fluxx. They said that it would have been better just to flip a coin. We’re just the right amount of competitive that we want to challenge each other, and Fluxx doesn’t give us that chance. Another game that has been banned from the table is the simple little card game Mow. I’m not sure whether it’s the simplicity or they just hate games with cows. Some others you might try could be Perudo (Liar’s Dice), Tsuro, and Lunch Money (I really like this one, but it is often hit and miss in groups). This sounds like you’re having great fun, and I might have to try to get something like that going in my office at some point. Thanks for the suggestions – I almost bought Tsuro the other day, as it plays well with multiple people and a couple of our gamers like abstract games quite a bit. Lunch Money is a game I played years and years ago, and have been meaning to pick up for this group. I think it would go over well! Just FYI – I picked up Tsuro this weekend at Borders during a 33% off sale. Gonna try it out with the office peeps.